Homemade Stuffed Crust Pizza, it’s so easy to make Homemade Stuffed Crust Pizza at home you’ll wonder why you didn’t try Homemade Stuffed Crust Pizza before. My kids are a huge fan of stuffed crust pizza from pizza hut, so I decided to make Homemade Stuffed Crust Pizza. I made it and they loved it so much. 1. Combine ¾ cup warm water, sugar and yeast in a small bowl and stir it until combined. 2. Let mixture sit for 8-10 minutes, until foam begins to build on surface. 3. In a large bowl sift flour, add salt, olive oil and mix it well. 4. Add yeast-water into the mixture and combine using a fork until you can use your hands, add water if required to make a smooth sticky dough. 5. Dust a clean flat surface with flour and knead the dough until the dough has a smooth consistent texture. This should take about 2-3 minutes. 6. Rub a light coating of oil on dough and put in air-tight container and store in warm place for 1 hours, until it doubles in size. 1. First turn the oven on 450°F (230°C) for preheat. 2. Take a prepared dough, punch down dough, and roll it around 18 inches medium thin circle shape. 3. 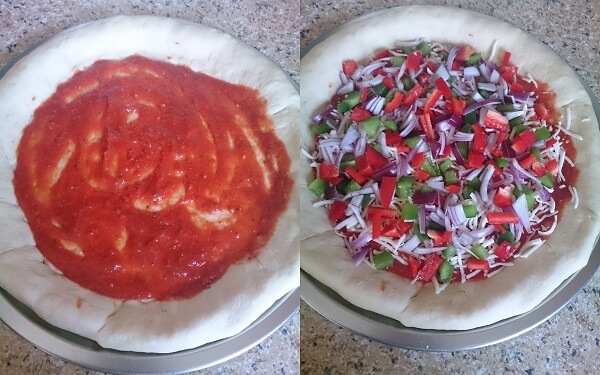 Take the pizza baking round tray, brush it with the little oil and place the rolled crust on it. 4. Now arrange the string cheese stick and make a ring around inside the edge of the tray with using string cheese. 5. Apply little water on uttering edges and fold over the dough to cover cheese, then press folded edges using fingers and seal it completely. 6. Spread homemade pizza sauce on prepared crust, spread ¼ cup shredded cheese and topping (onion and peppers). 7. Brush or spry oil on edges of crust, spread remaining shredded cheese and sprinkle Italian seasoning. Pizza is ready for bake. Now bake it 450°F (230°C) for 18-20 minutes or till golden brown in preheated oven. 8. 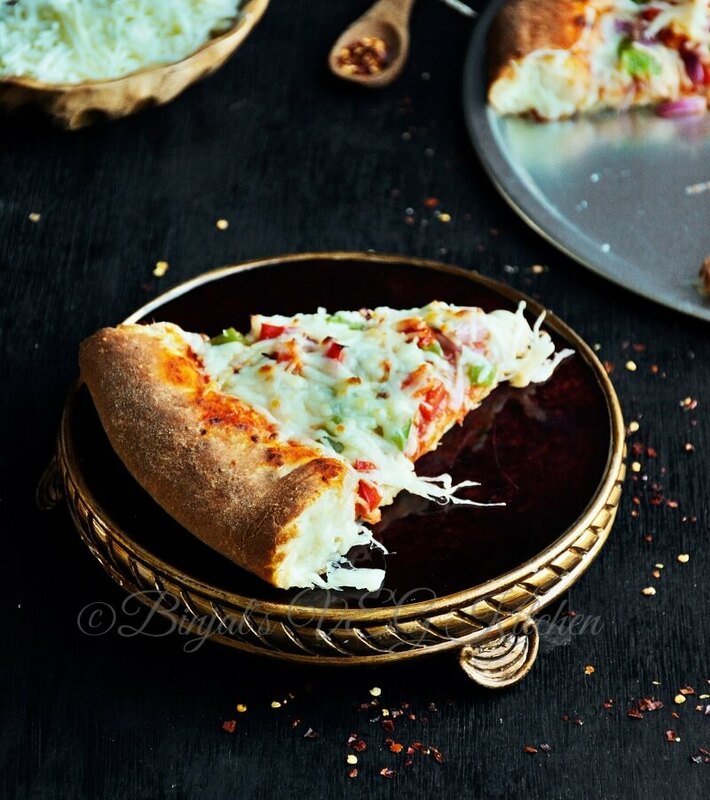 Homemade Stuffed Crust Pizza is ready, serve it with ketchup, tomato sauce, coke, whatever you like………..and enjoy restaurant style pizza at home. 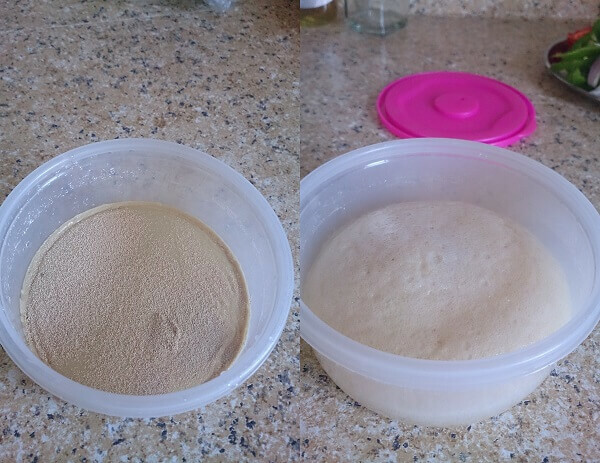 • You can use instant yeast for dough, so no need to soak yeast in the warm water. You can add it directly into the flour or use packet instruction. • Use always best quality yeast for best crust. • Soak yeast always in the lukewarm water, do not use hot or cold water otherwise your Dough will not be raised double. • You can use cheese block instead of string and cut into sticks for stuffing. 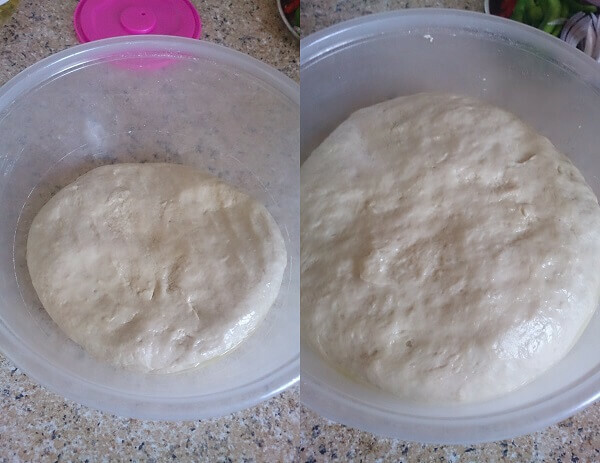 • You can store the dough in air tight container in refrigerator, and you can make pizza whenever you want. It can be stored for 1-2 weeks. • If you don’t like soft base, then bake only base for 4-5 minutes with applying/brushing olive oil before topping, it will gives you best crispy crust, then add sauce and toppings and bake it again for 10-15 minutes. 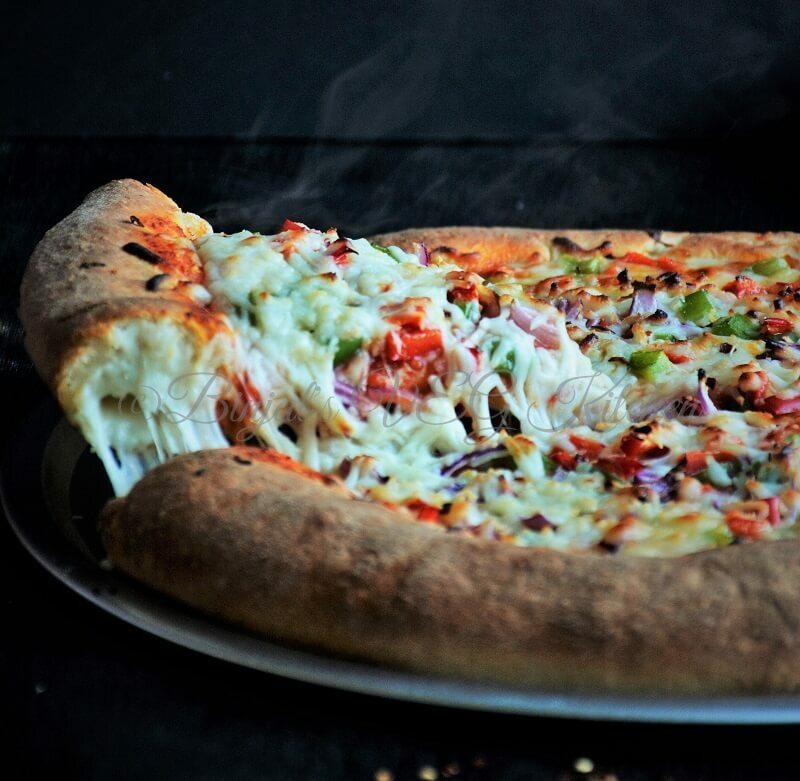 Homemade Stuffed Crust Pizza, it’s so easy to make Homemade Stuffed Crust Pizza at home you'll wonder why you didn't try Homemade Stuffed Crust Pizza before. 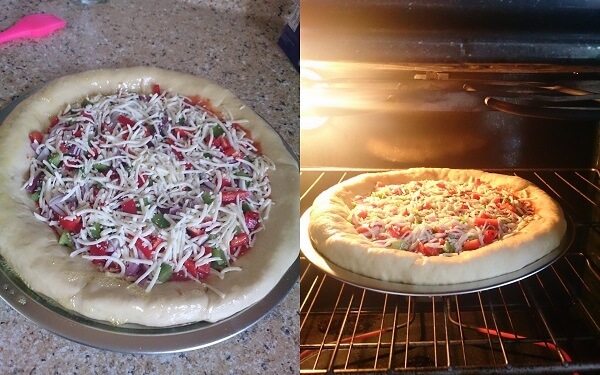 My kids are a huge fan of stuffed crust pizza from pizza hut, so I decided to make Homemade Stuffed Crust Pizza. I made it and they loved it so much. Combine ¾ cup warm water, sugar and yeast in a small bowl and stir it until combined. 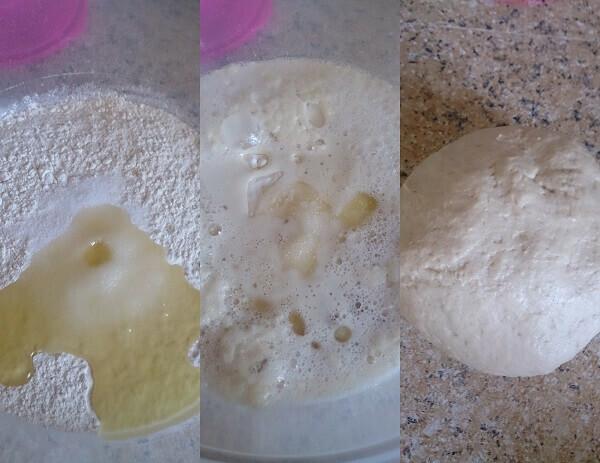 Let mixture sit for 8-10 minutes, until foam begins to build on surface. In a large bowl sift flour, add salt, olive oil and mix it well. Add yeast-water into the mixture and combine using a fork until you can use your hands, add water if required to make a smooth sticky dough. Dust a clean flat surface with flour and knead the dough until the dough has a smooth consistent texture. This should take about 2-3 minutes. Rub a light coating of oil on dough and put in air-tight container and store in warm place for 1 hours, until it doubles in size. First turn the oven on 450°F (230°C) for preheat. 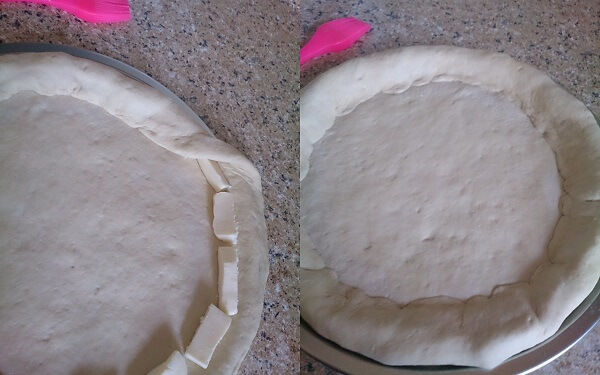 Take a prepared dough, punch down dough, and roll it around 18 inches medium thin circle shape. 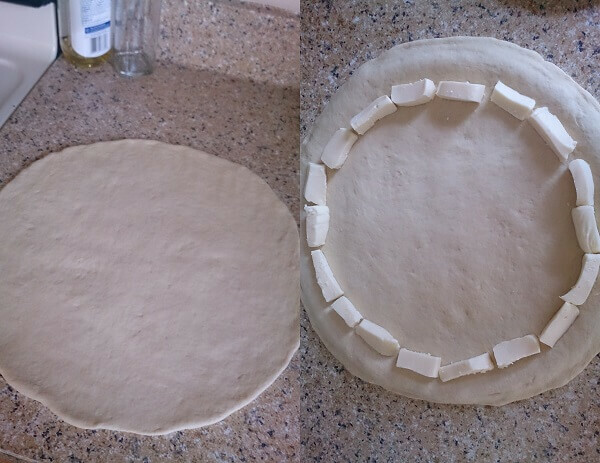 Take the pizza baking round tray, brush it with the little oil and place the rolled crust on it. Now arrange the string cheese stick and make a ring around inside the edge of the tray with using string cheese. Apply little water on uttering edges and fold over the dough to cover cheese, then press folded edges using fingers and seal it completely. Spread homemade pizza sauce on prepared crust, spread ¼ cup shredded cheese and topping (onion and peppers). Brush or spry oil on edges of crust, spread remaining shredded cheese and sprinkle Italian seasoning. Pizza is ready for bake. Now bake it 450°F (230°C) for 18-20 minutes or till golden brown in preheated oven. 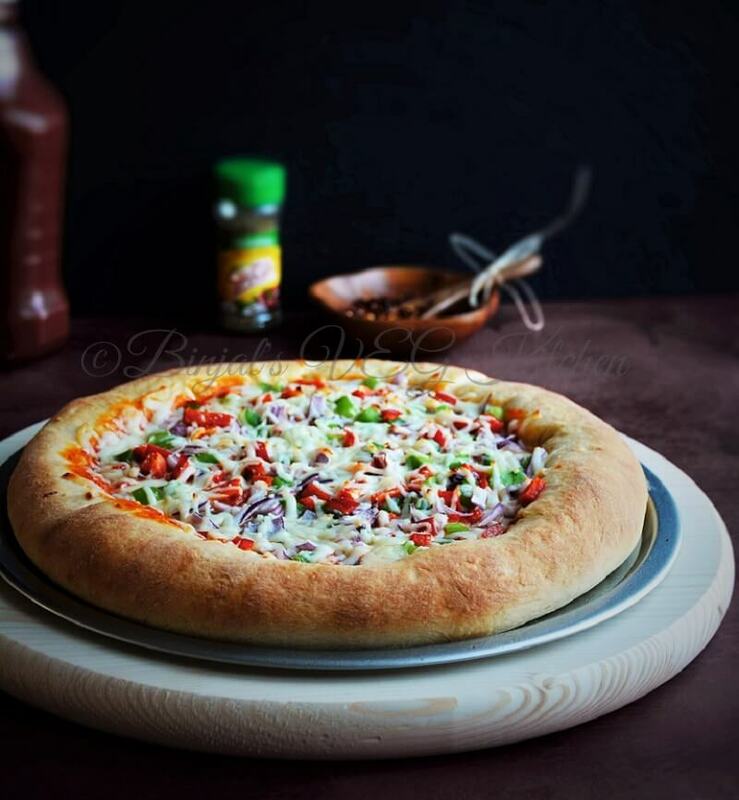 Homemade Stuffed Crust Pizza is ready, serve it with ketchup, tomato sauce, coke, whatever you like………..and enjoy restaurant style pizza at home. • If you don't like soft base, then bake only base for 4-5 minutes with applying/brushing olive oil before topping, it will gives you best crispy crust, then add sauce and toppings and bake it again for 10-15 minutes. Amazing issues the following. My business is very glad to peer your posting.. Pizza and pizza Thanks and I am looking ahead to contact you. Will you generously fall us a postal mail? Thank you Binjal for this awesome pizza recipe 🙂 Can’t thank you enough! How many base can be made from this dough? yes you can make in Otg!! otg is a same as a regular oven, but first you bake the base for few minutes then spread toppings and then again bake in otg. you can use bake mode for base and grill mode for with topping!! Hi…your recipes are lovely n very detailed. Thank you. 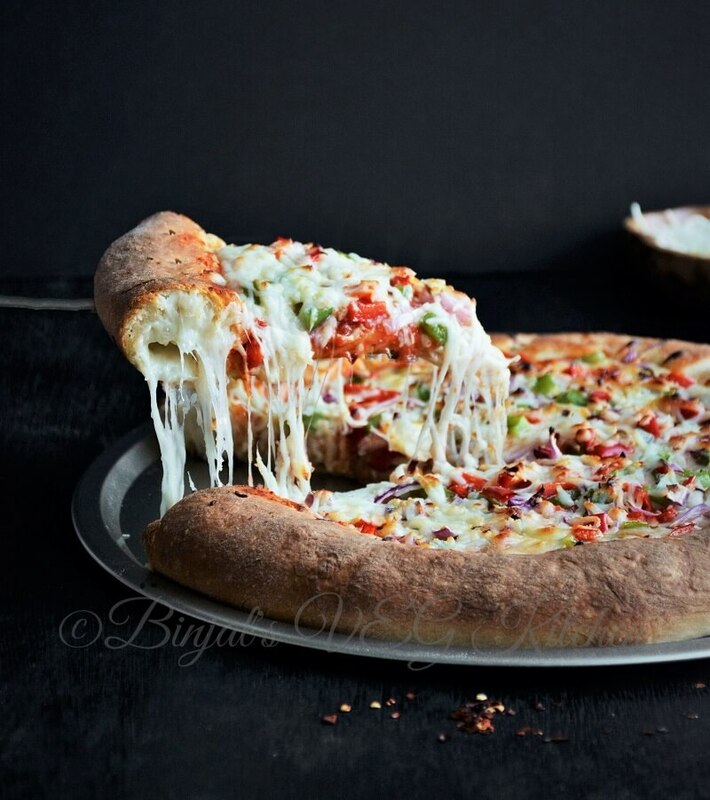 Can we bake the pizza base first n then add the toppings n all ??? Won’t the cheese n veges dry if we bake for 18 to 20 mins??? Mouthwatering….Looks yummy,,,,Going to try tmw eveng…. That’s a really tempting pizza. Looks so delicious. That’s one very tempting pizza. How to roll pizza ? Dough of it being too soft it’s difficult to roll with dusting like chapati. N so difficult to lift n roll on all sides ! do not roll that much thin like chapati! roll medium thin, you can lift using your hands and elbows like rumali roti and place it on tray!! The pictures are great!! Cant wait to try the recipe…just one question, where did you get the cheese strings from? Can you get it at any frozen foods store?